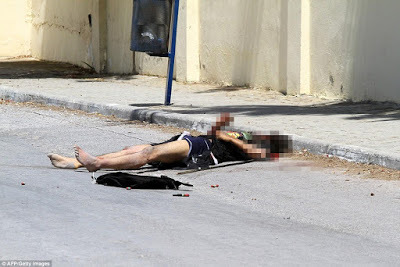 A Tunisian police officer has revealed how he put 'two bullets' in the ISIS assassin to end his slaughter of holidaymakers lounging on a tourist beach. The policeman, who wished to keep his identity secret, said he shot the murderer Seifeddine Rezgui following his 25-minute rampage. He spotted the gunman while he was praying in a side street and shot the 23-year-old aviation student, who was armed with an assault rifle and grenades. Following his killing spree, Rezgui stopped outside a housing development belonging to Mayel Moncef, 56. As bullets rained down on the gunman from rooftop snipers, he dropped to his knees in prayer, allowing a grenade to roll from his hand and into the gutter. Mr Moncef then picked up a stack of terracotta roof tiles and threw it on the head of the gunman, causing him to stumble. He walked a few yards before the policeman shot him dead. 'I put two bullets in him. I haven't slept since', he told the Sunday People. Witness accounts say Rezgui was seen laughing and joking among the midday bathers, looking like any other tourist. But he was actually carefully picking out the victims he would murder with a Kalashnikov hidden in his parasol. In the murderous rampage on the crowded Tunisian beachfront at El Kantaoui near Sousse, he killed 38 - with 36 seriously wounded. 'One minute you're on a sun lounger then the next there are bullets whizzing past your head', one witness said. Last night, a Tunisian Interior Ministry source said that while Rezgui did not have a criminal record, he was known to authorities for 'low level radicalism' and was once stopped by police for smoking cannabis. The source confirmed Rezgui was an active member of a radical group called Islamic Youth and would go to mosques controlled by radical preachers. By the time he launched his killing spree in Sousse, Rezgui was said to be working with ISIS, which yesterday posted a picture of him with two assault rifles either side of him, on its website. Using Rezgui's jihadi name, Abu Yahya al-Qayrawani, it described him as 'Our brother, the soldier of the Caliphate'.